Welcome to Patio Place, Orange County commercial property owners’ premier choice for stylish, long-lasting, and competitively-priced outdoor furniture and accessories. Since 1989, we’ve served as the leader in contract furniture sales, having sold to countless restaurants, bars, yacht clubs, apartment complexes, airports, retail store, and hotels throughout Orange County. A few of our past satisfied commercial clients include Dave & Busters, Park Newport Apartments, and The American Legion Veteran Service Organization in Newport Beach. Our family-owned business consists of helpful, knowledgeable professionals with over 25 years of experience in commercial outdoor furniture sales, design, installation, service, and repair. As such, when you work with Patio Place, you can expect superior customer-focused services, a quick turnaround time, and unbeatable rates for high-quality brand name patio furniture and related products. Patio Place provides one of the largest selections of outdoor furniture in Orange County. Our selection includes cast aluminum furniture, aluminum furniture, wicker furniture, awnings, umbrellas, bar stools, outdoor cushions, fire pits, barbecues, gas logs, and more. Additionally, because we’ve maintained strong ties with the industry’s most-trusted manufacturers over the years, we are able to offer our commercial clients some of the best furniture prices possible on leading brands, such as Sunbrella, Shade Depot, Patio Renaissance, Treasure Garden, Hanamint, and Sunset West. All of the outdoor furniture and awnings we sell are made with premium materials and are backed by extensive manufacturer-warranties. 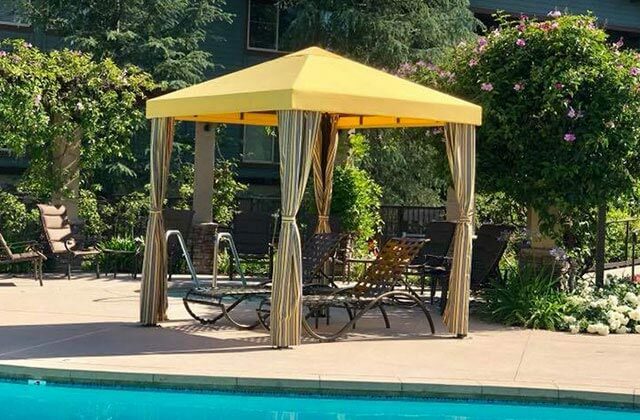 To protect your investments even further, we sell standard and custom fabricated protective covers that safeguard your outdoor patio furniture against rain, dust, dirt, and other harmful elements. From valance details to Sunbrella cushion fabrics, we make sure your outdoor furniture provides the ultimate comfort and utility, as well as enhances the decor of your business. We have the skills and expertise to satisfy almost any outdoor furniture restoration and repair need, including umbrella spoke and strap repair, umbrella restitching, swing and cushion replacement, full-service cleaning and refinishing for like-new furniture, chair reslinging and restraping, and frame powder coating. Additionally, we offer logo and slogan customization for company banners, awnings, and umbrellas; solar LED light installation; and free old furniture removal and haul away with your order. Whether you need 100 chaise lounge chairs with 60 logo embossed umbrellas before the beginning of your hotel’s pool season, or you’d like to resling and treat your existing outdoor dining tables before an upcoming banquet at your country club, the outdoor furniture specialists of Patio Place will assist you from project design to product delivery, ensuring you receive exactly what you’re looking for. We can either visit your Orange County commercial location with sample umbrellas, fabrics, cushions, vinyl straps, frames, etc., so that you can fully experience which of our outdoor furniture products are best suited to your business, or schedule an one-on-one appointment at our conveniently located showroom in Costa Mesa to view a broad range of our beautiful furniture on display. 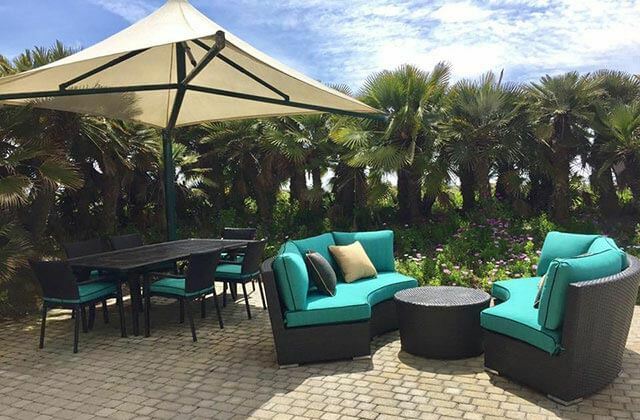 Call us at (714) 569-9242 to schedule an on-site consultation of the outdoor patio furniture and fixed awning that’s perfect for your Orange County business, or ask about our comprehensive furniture cleaning and repair services. We look forward to assisting you!